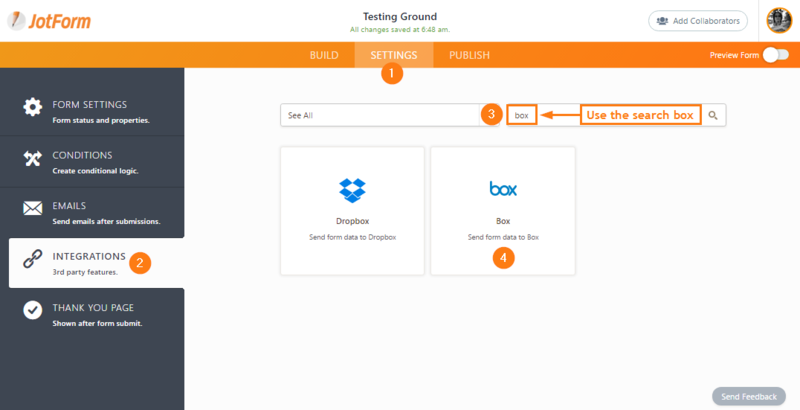 Box is a simple and secure file sharing platform used by 150,000 businesses. It is great for storing files online, secure file sharing, mobile content management, project collaboration and document management. 1. Click SETTINGS at the top, INTEGRATIONS on the left, search for BOX then select it. 2. You will be asked to authenticate your Box account. Simply click the AUTHENTICATE button to proceed. 3. 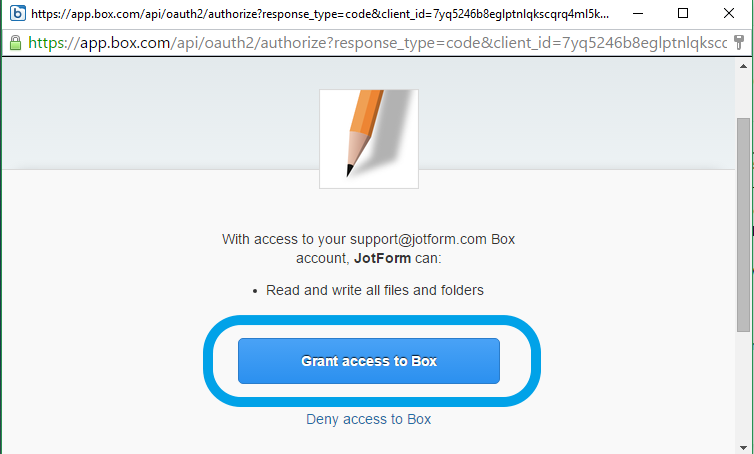 Login to your Box account and click the Grant access to Box button. 4. 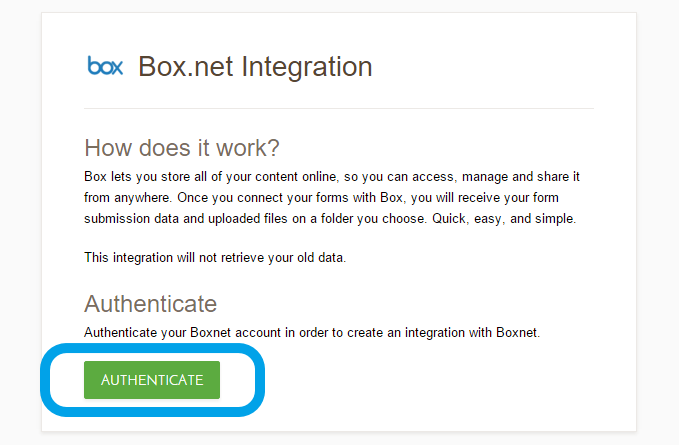 After authentication, you will have to create your Box Folder. You have the option to select defaults or use custom folder name in the following. You have to click the Apply button save the selection. Note that you can also add the submission date before the submission folder name. Simply check the option if you want to add it. 5. Now, simply click the COMPLETE INTEGRATION button to save. 6. 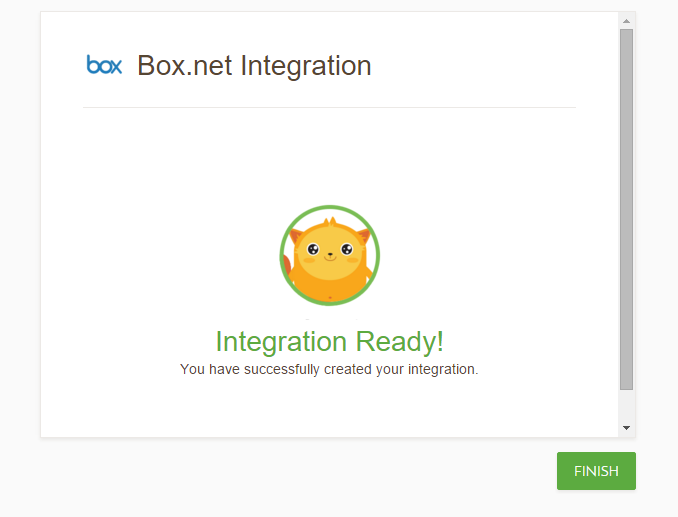 The integration is now ready. Simply click "Finish" button to complete it. That's it! If you need some help, please let us know by posting a comment below or head on to our Support Forum. Is it possible to capture form responses solely on Box? The response must not be captured anywhere outside of the integrated box account. How can this be saved into an existing file in Box? I'm using an enterprise account at https://exim.app.box.com/. I'm logged in, but the result after i click 'authenticate' is an error message that authentication failed. I'm also only granted permissions to the account as the co-owner of one folder off the root. What can I do to get this integration to work? 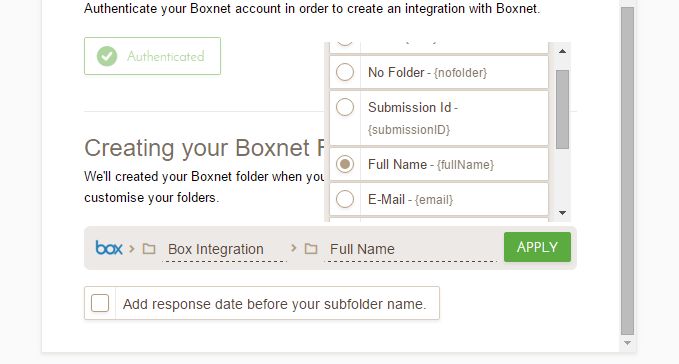 I followed the above steps to integrate Box, however I cant find the folder JotForm created for me in my Box account? How can I split Name or Address field to it's sub-titles? I have a form integrated with Dropbox.